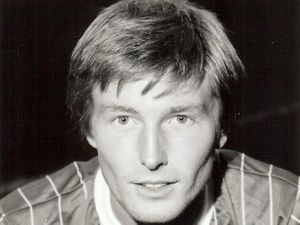 One of only seven players whose Chesterfield careers survived the 1983 financial crisis, Worksop-born Gary Bellamy came to the professional ranks from an apprenticeship in June 1980, having earlier chosen football over the possibility of a career with the Nottinghamshire County Cricket Club. Tall, elegant and composed, Gary looked the classiest member of the '84-5 championship team until injury struck, keeping him sidelined for fifteen months. A contract dispute led to his departure to Molineux in July 1987, for a tribunal-fixed fee that undervalued him and served only to reopen old wounds, where Wolves and transfer fees were concerned. His contribution to a resurgent Molyneux side was immense, as they charted a rapid rise back through the Football League: they also made a tidy profit when selling him to Leyton Orient in 1992, where he remained a first-team regular for four seasons. Gary assumed the longest job title in Association Football when he became Chelmsford's Player/Commercial Manager/Community Officer in the summer of 1996. Oddly, he was on loan to Braintree Town at the time that he was promoted to the position of Chelmsford's Joint Manager in November of that year. As Manager he guided Chelmsford to promotion to the Beazer Homes Premier in 2001, but left to take up the reigns at Dover Athletic, of the Conference. That didn't work out, he was sacked in November 2001 and he returned to Essex and to Braintree Town, where he served as manager until 2003. Gary left football altogether after leaving Braintree and found that he didn't really miss the game; he continued playing cricket however, and is a member of the Kelvedon and Feering Club, which is based near Colchester. Gary works as an Estates Manager for a social landlord and greatly enjoys being able to make a difference to the lives of people who, for whatever reason, have not had the same chances as others. For Chesterfield: 181+3 league appearances, 6 goals.